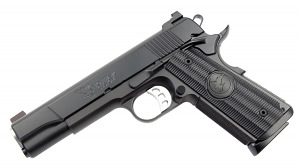 The Nighthawk Falcon is a full size government model 1911 from Nighthawk Custom loaded with enhanced features to make it a stellar fighting weapon. Features a stainless steel frame with black Nitride finish for excellent wear resistance, 5" match grade barrel with extra thick bushing, complete dehorning for comfortable carry, and G10 grips. Comes with case, manual and (2) magazines.